"O Courel dos tesos cumes que ollan de lonxe" (O Courel, with its high peaks looking out into the distance) extends between O Cebreiro, entry point from the Way of Saint James in Galicia, and the river Sil to the south, but not touching it. It is one of the oldest lands on the Peninsula. It has manifest geological interest: a multitude of caves and tunnels and the spectacular fold of Campodola (Quiroga), regarded as one of the geological monuments of Europe. "Terras do lobo, cavorco do xabaril..." (Land of the wolf, the boar’s stomping ground...) O Courel is Galicia’s great green reserve. All the species except coastal ones are represented in this geographical mountain crossroads, with the best of Atlantic and Mediterranean characteristics. 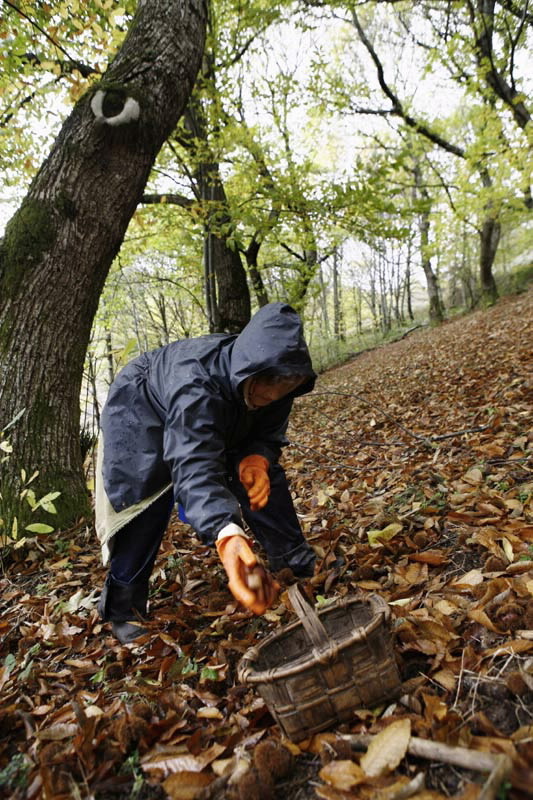 There are chestnut trees around the villages and a stronghold of olives in Quiroga. The typical forests of O Courel are the dehesas, a name used to refer to the forests of many other tree species, generally at the heads of the rivers. "Eiquí síntese ben pouco o que é un home...." (Here one hardly feels what a man is...) Reads the song to the beauty of nature in the verses by the national poet Uxío Novoneyra. 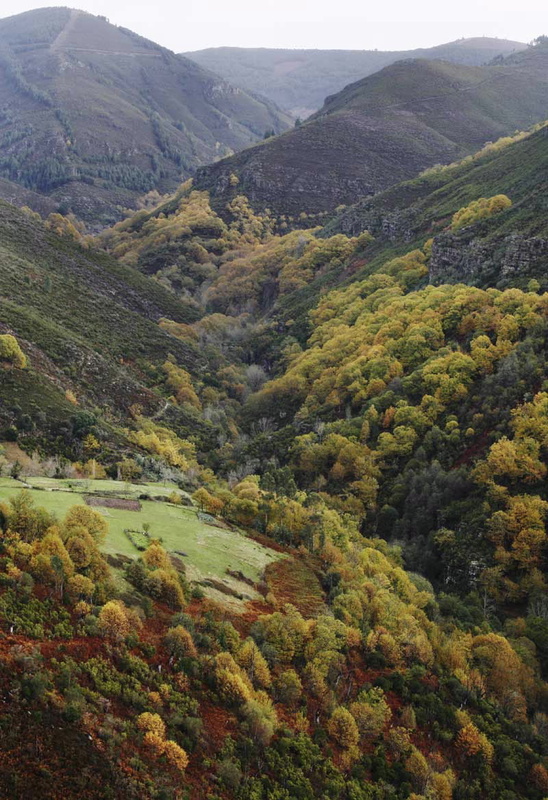 The sparse population of these places, where the provinces of Lugo and Ourense come together with the Leon region of El Bierzo, is today one of the oldest in Europe. 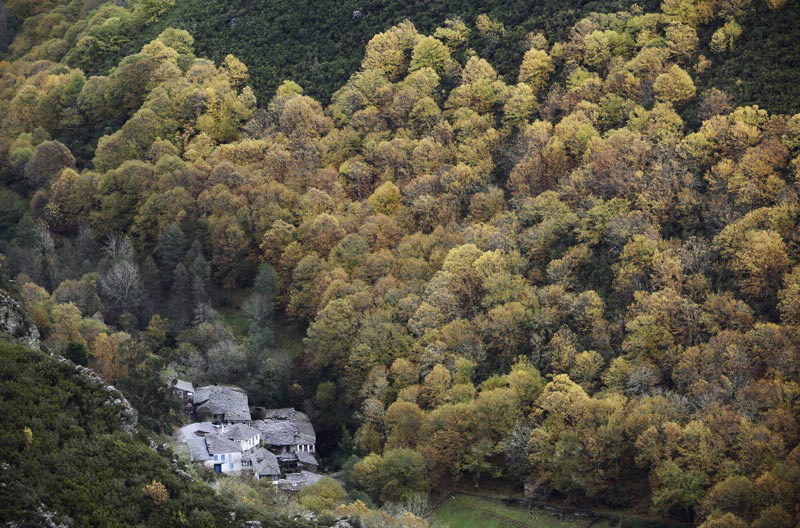 But the narrow valleys of the Lor, Lóuzara, Selmo and Soldón rivers exude real diversity and history. 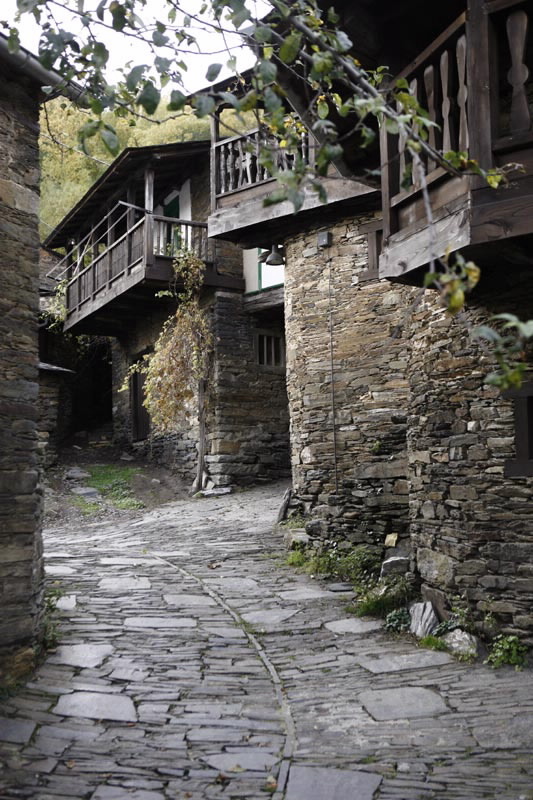 O Courel’s other heritage, its slate villages the heart of the mountain range, can be found on the green slopes. From Romeor to Froxán and from A Ferrería to Ferramulín, the four cardinal points. The LU-651 road crosses O Courel from north to south. 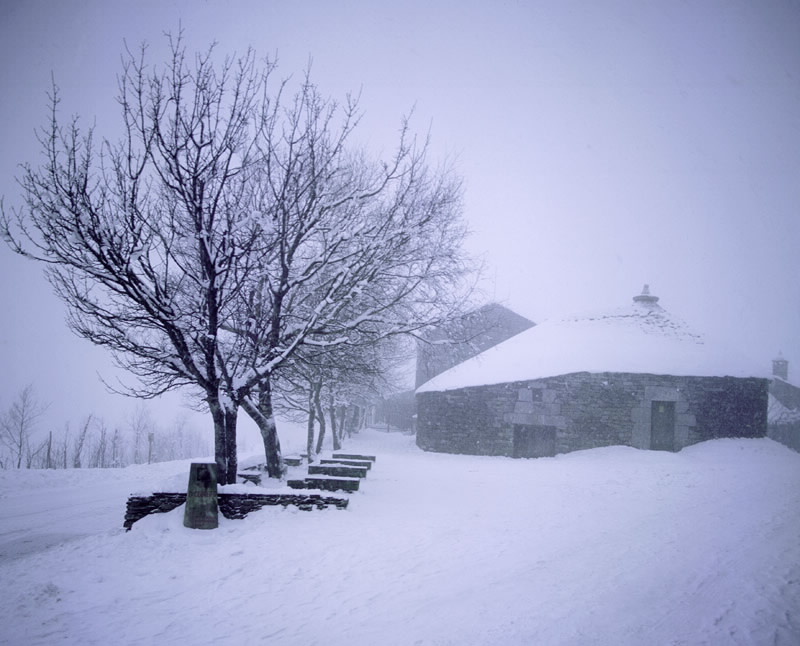 It is reached from the north on the descent to O Cebreiro on the LU-633 Pedrafita- Sarria road. From the south, there is a turnoff in Quiroga on the N-120 Ponferrada-Ourense road. Nature workshop of Moreda do Courel (Folgoso do Courel). Extreme southeast of the province of Lugo. Municipalities of As Nogais, Pedrafita do Cebreiro, Folgoso do Courel, Samos, Triacastela, O Incio, A Pobra do Brollón, Quiroga and Ribas de Sil. O Courel is, undoubtedly the green reserve of Galicia and it also has a rich historical heritage. The municipality of Folgoso do Courel occupies the centre of the mountain range. The area can be reached from its main towns, Seoane and Folgoso, the old and the new municipal capital, respectively, for the two are on the region road which links the territory from north to south, from Pedrafita do Cebreiro to Quiroga. But O Courel’s natural life demands that we venture along the forest paths on foot. From Seoane take the first turnoff to the village of Romeor. From here it is necessary to walk a few kilometres to penetrate a magnificent forest and inspect the tunnel of A Louseira, built in Roman times to channel water. On the turnoff of the Seoane road towards Moreda and Parada we approach one of the not to be missed visits: the forest of Rogueira. There is a nature workshop in Moreda, open from spring to the beginning of autumn, and during winter holiday periods. 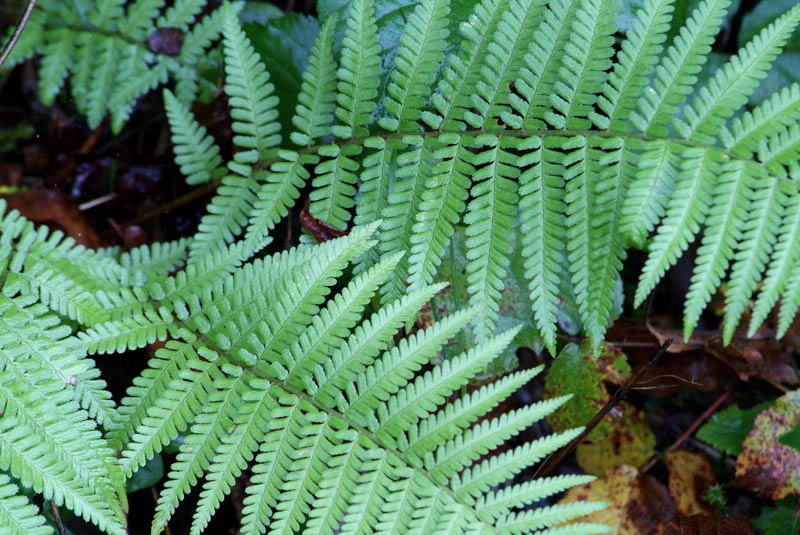 The grandeur of this forest lies in its botanical reserve which has over 800 species in just 200 hectares. The route from the bottom edge of the forest is about three kilometres long up a steep slope. Small rivers, like the Fonte do Cervo, which arise at the summit, run down the slopes. The summit is a massive rock with two springs from which flow water of different colours and flavours. One is crystal clear and with hard water; the other is brown and ferruginous. Another access route to the forest from the upper part of the Formigueiros Peak (1,639 m) is on the Visuña, Ferramulín, Vieiros, A Seara and Vilarbacú local road, all picturesque villages. From here the ascent to two of the natural attractions of O Courel can be planned. One is the pool of Lucenza, of glacial origin, which sometimes dries up in summer. The other is A Buraca das Choias, a cave from which a small river flows. Peaks attached to the piornales and generally with a predominance of scrubland and also moors and “xesteiras”. Forests at medium altitudes, of oaks, birches and beech trees. Well preserved outstanding leafy forests like the forest of Rogueira. Abundant fauna with more than 170 species of vertebrates: wolves, foxes, wild boar, badgers and pine martens. Interesting colonies associated with deep fissures and caves.